Keep the paradise a paradise with Trash Hero! Have you ever wanted to head to the beach one day and get filled with remorse at the amount of trash that fills the water and the beach? We have all seen how sloppy some have become at taking care of their own waste. Luckily, with the increase of awareness, campaigns, sheer love for the beauty of the world and the education on the unnecessary waste effects on the World, more people have joined hands and tries to better themselves and give mother earth a helping hand. After all, we are in natures home with all its beauty and wonder, taking care of her shouldn't be second guessed. To give you an example. Have you ever had a party at home when you were younger or a birthday party for your children? Well, that is trash for around ten or twenty people. Now, think if thousands of people came to your party? This is happening daily on the beaches and in the ocean. One group in Thailand called Trash Hero have done something unique by taking the necessary steps to clean up and prevent the above from happening. You can read more on their web page, trashhero.org/. With love, inspiration, education and by reaching out to people with the same feelings they've managed to connect people and businesses alike, wether it's on a holiday or long term, and create what they like to call, Trash Hero Monday. 2013 an idea was born in Koh Lipe, and today, Trash Hero is officially registered as an charitable non-profit organization that even won Thailands Green Excellence Award, Nov 8 2014. 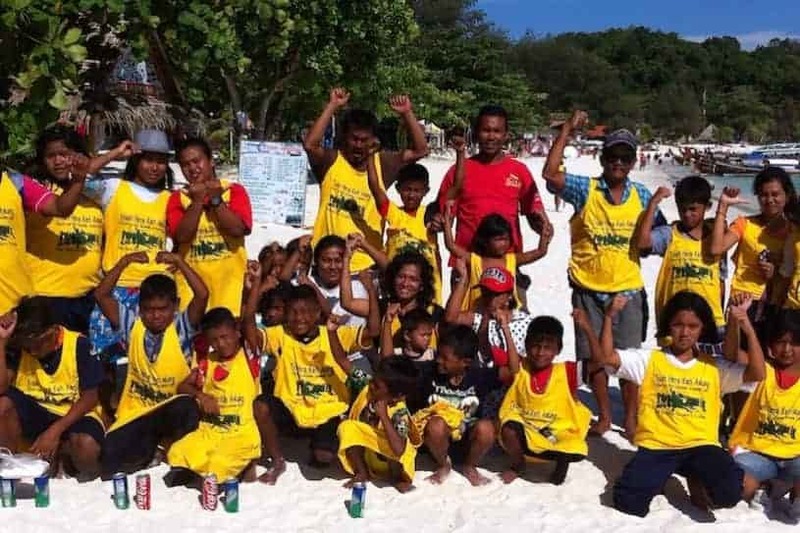 Trash Hero have spread across Thailand to Ao Nang Krabi, Koh Lanta and even Gili Meno in Indonesia and more destinations coming. "The idea is a resounding success! Since the first Trash hero Monday on December 8, 2013 nearly, 1,000 volunteers from all over the world have come together each week to remove more than 21 metric tons of garbage from the islands’ beaches! And every Monday the project continues." If you too would like to participate I recommend you to visit their webpage and you will find all the information you need. They have a camp for volunteers and it is absolutely free to join. Even transportation to and from the site, including a spot in a tent at the camp site is free. Every donation goes 100% to the charity and everything needed to clean up in a recycling manner. With more people thinking and acting like Trash Hero, mother earth would have a much more sustainable future and give our future generations a chance to see her beauty and life! The cause is contagious, more organizations want to follow the same path. And that is amazing to be honest! All the trash that gets picked up gets sorted as much as possible at the camp site. Later on it's transported by boat to the mainland for recycling and waste handling. Some of the recyclable and reusable can be resold by a private company handling Koh Lipe's waste transportation. We encourage anyone to join and if not, give a helping hand and pick up what you see that doesn't belong. Have you heard the expression, -"out of little acorns grow huge oaks"? It means in this context that, if we all do a little, no matter how small, together it makes a huge difference. Just by throwing your trash in a garbage can, you still make a big difference in the World. With that, we get rewarded with a more healthy and beautiful mother earth. That my friend, is something to strive for!